On tonight’s episode Michonne, Aaron, Daryl, and the others are in the foggy dark graveyard trying to make their way out with Jesus’s body. Michonne hears an eery voice say “you die now.” Walkers continue to come at them but they make their escape. Night has fallen. Negan comes out of the shadows in the quiet community. He smiles. He picks a tomato and eats it. He grabs a shovel and heads into a house. He makes his way up the stairs into an empty bedroom. Morning comes. He attempts to climb the wall but Judith sees him and points a gun at him, forcing him down. They talk. He promises he won’t hurt anyone even if they try to hurt him. Judith lets him go but warns if she sees him again she will shoot. Tara and the others start to get nervous about Michonne and the others. Four of them head out to loop around the grid. 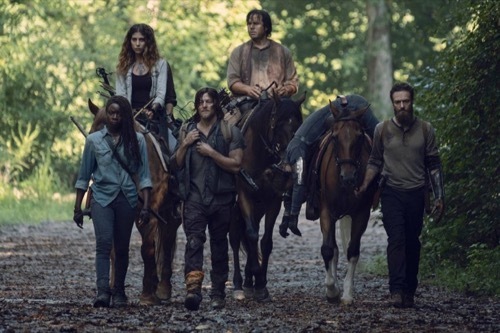 Meanwhile, Michonne and the gang make their way home as fast as they can with an injured Eugene. Michonne and Daryl walk and talk alone. She thanks him for looking for Rick and for after. Daryl’s dog barks, alerting them to walkers. They wonder if they are true walkers. On a bridge, Daryl covers one end while Michonne gets the other end. They work their way through the half dozen and realize a few aren’t real walkers, just people wearing a mask – The Whisperers. They kill them all but one and take her with them. Negan sits to take a break and eat. He is disturbed by several walkers who he struggles to kill. He stops by a stream and drinks, getting sick. He moves on, walking further. Meanwhile, Michonne and the others arrive home with sad faces and Jesus. The others see and become distraught. Negan lets himself into a store. He tries on a coat when several dogs come in. They growl and chase him. He jumps up high. After they leave he attempts to make his getaway but another dog chases him. He manages to open a door to the outside, throwing an incoming walker towards the dog. Luke and Alden are out looking for Michonne and the others. Luke has some trouble with two walkers. Alden comes to his rescue. They hear a herd in the field. Michonne and Daryl question their new hostage. She tells them she doesn’t have a name, none of them do. She won’t talk. Michonne tells them she needs to head back home but they can question her further. She tells Daryl alone if she doesn’t talk, he knows what he has to do. Siddiq gets Eugene’s knee back into the joint. Eugene carries on about the pain. Rosita runs outside suddenly and throws up. Siddiq follows. He tells her she has been through a lot. She tells him she is pregnant and it is when they were having fun before Gabriel. Daryl and Henry talk. He needs to figure out who he is here. Meanwhile, Megan has made his way back to prison. He lets himself in and whistles that familiar whistle, looking over the wreckage. He hears banging in the distance. It’s a walker Negan recognizes as Big Richie. Aaron apologizes to Michonne for not seeing what she was trying to show them all along, that they need to stay in their communities safe and together. Michonne talks Daryl into seeing that Tara needs help now that Jesus is gone. He is a good judge of character. Negan sits at his old table. He gets up and starts organizing the place. After he is done he sits on the couch in despair. He hears more walkers and makes his way out to the yard. He takes out several of them but leaves Big Richie alone. He looks at his compass Judith gave him. He holds it and smiles before heading back to take out Big Richie. The gang all takes part in burying Jesus and saying their goodbyes. After, Daryl works harder to get more answers from their hostage. She finally breaks and tells Daryl that it is her and her mom out there traveling with a few others wearing skins. They only killed his people because that is what they do. Daryl lets her go back to her cell while Henry yells to leave her alone. They talk after Daryl leaves. She thanks him and tells him her name is Lidia. Daryl overhears from outside the window. Judith sees someone coming down the road on a dirt bike. She shoots. It is Negan. He spins off the bike and hits the ground. She runs over and keeps her gun drawn. They talk. He admits there is nothing out there for him. Alden and Luke come upon a walker in a field. He stops walking. Luke realizes how strange this is. They stop and stare and start to look around. More surround them. One walks to them and tells them the trail ends here.